I love the Shutterbean Blog. Lots of great recipes and, in addition, Tracy is a great photographer and her design sense is inspiring. 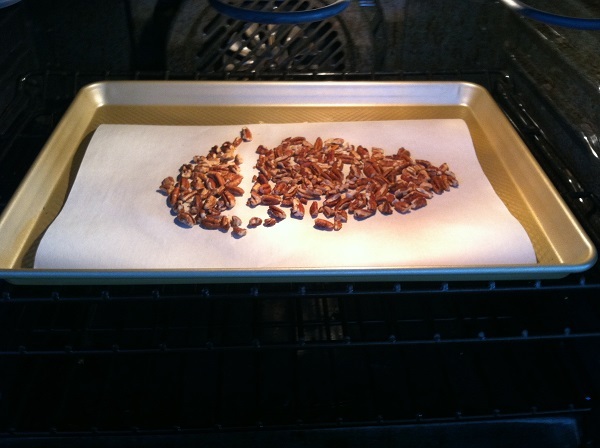 Recently I made a couple of her recipes…. 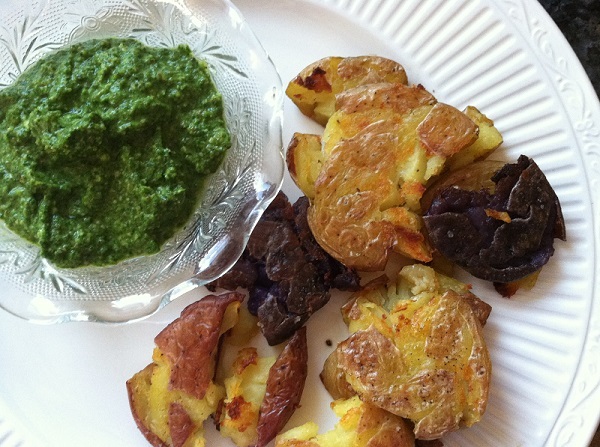 Crispy Smashed Potatoes with arugula pesto were wonderfully crispy on the outside, tender on the inside and extra specially yummy dipped in arugula pesto. First the pesto. 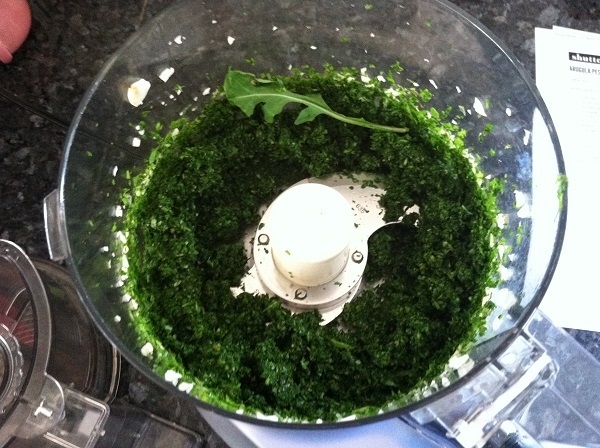 Lots of arugula and some garlic…. 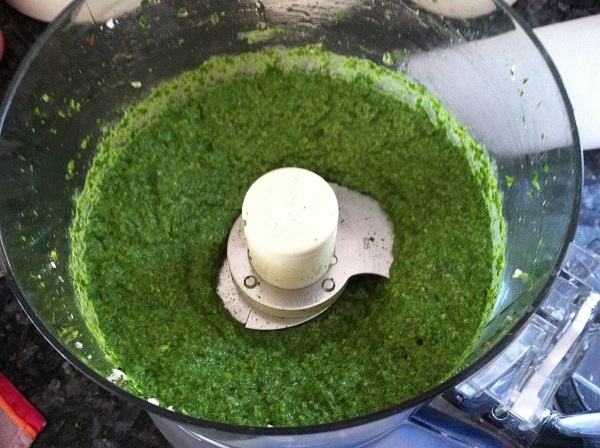 I then realized the recipe called for fresh basil too, which I didn’t see when composing my shopping list (after all, it’s called Arugula Pesto, not Arugula-Basil Pesto), so I added a ton of freeze dried basil I had in my spice cupboard! 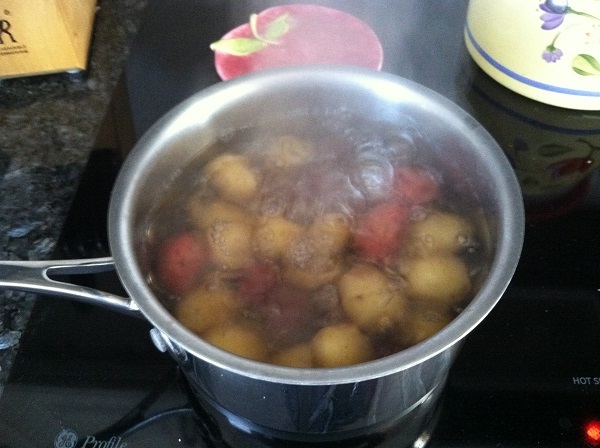 Then olive oil and lemon juice…. The recipe also calls for nutritional yeast. Never heard of it before. It’s apparently popular with vegans as it’s a complete protein and has some vitamins. I wasn’t feeling in the need for a complete protein, since we were eating burgers with the potatoes, so I didn’t go out of my way to find it. 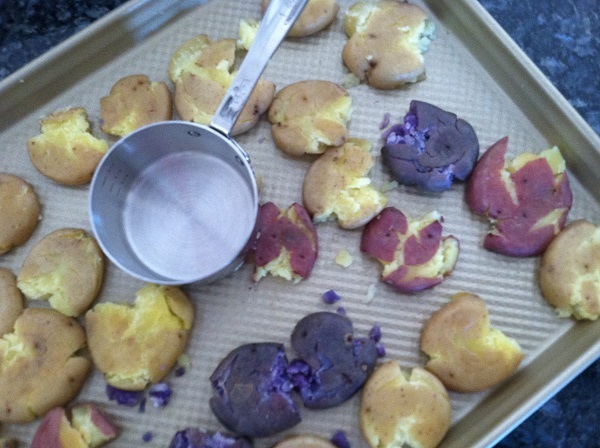 Take a sturdy measuring cup and smash each potato…. 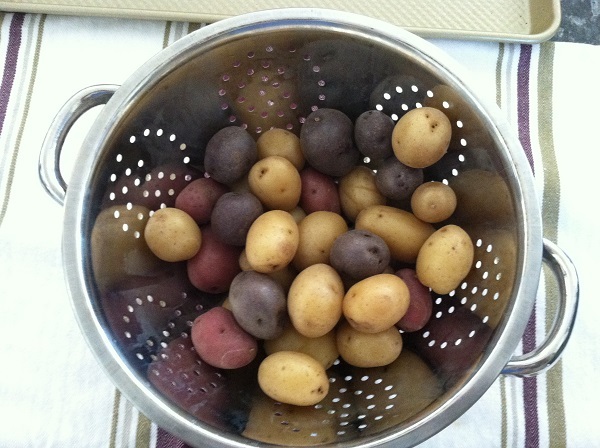 Toss with olive oil, salt and pepper, cook in the oven, flip them, cook them some more and then serve…. Really, really yummy and crispy and wonderful! 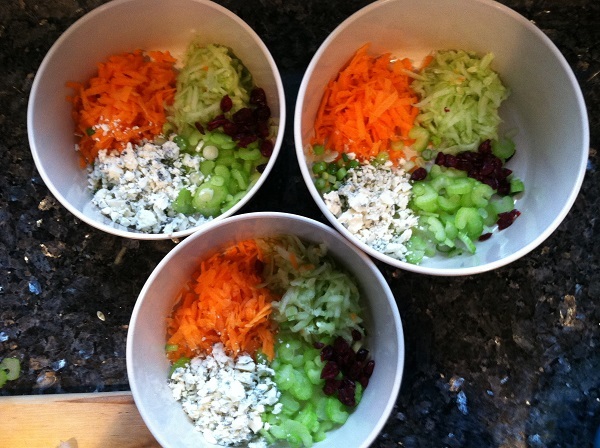 The second thing I made of Tracy’s was the Reset Button Salad. Or some semblance of it. I got creative. I was looking for something healthy to take for my lunches and this was perfect. 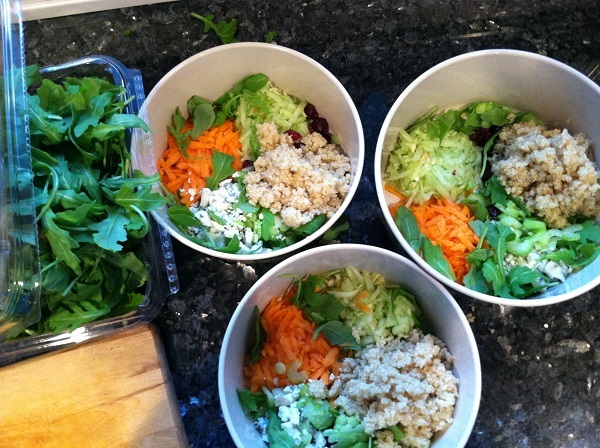 Then I put arugula on top so it wouldn’t wilt and then realized I didn’t get a picture of the quinoa so I took the arugula out…. 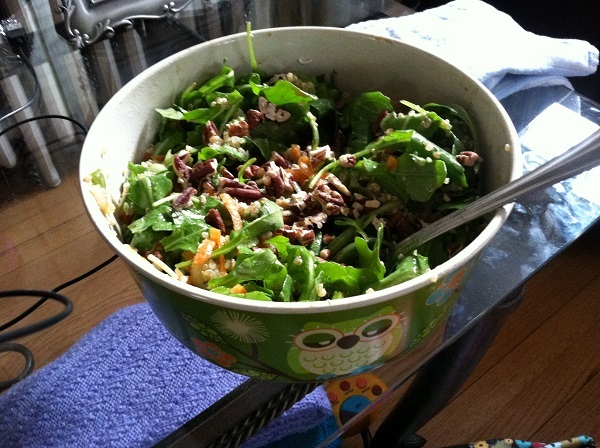 Posted in Uncategorized and tagged arugula pesto, crispy smashed potatoes, doodlebugs, owl bowls, reset button salad, shutterbean, world market on April 14, 2014 by lizytish.